Looking for some ideas for things to do in Guernsey? Here are some of my top suggestions. Guernsey, one of the Channel Islands, is a great place to visit for a summer or winter holiday, a long weekend, or even for a day. There is plenty to see and do and, because it’s only a short flight or ferry ride away from the UK, it’s a fantastic way to start exploring the fascinating and beautiful places on your own doorstep, before venturing further afield. If you only have limited time and want to make the most of your day trip to Guernsey, here are some of the best attractions on the island – they will give you a great overview of what Guernsey has to offer, and will whet your appetite for coming back! The impressive Guernsey Tapestry depicts the last 1,000 years (from 1001 to 2000) of Guernsey history, and everyone in the community took part in making it. Each parish on Guernsey created a panel, and as many residents as possible put at least one stitch into the finished product. The tapestry – on permanent display in St Peter Port – took over two years to make and is a beautiful way to learn about the events that have occurred on Guernsey over the last millennium. As well as the tapestry itself, there is an audio commentary and a gift shop. During World War II, Guernsey was occupied by the Nazis, as Hitler felt that the Channel Islands were the perfect place to start an invasion of Great Britain. For years, the islanders had to struggle to live side by side with the invading forces, and many died or simply ‘disappeared’. This museum tells the story of that occupation from the point of view of the islanders at the time, as well as from the Nazi soldiers’. One half trying to live, the other trying to obey orders. The German Occupation Museum is at once both heart breaking and fascinating, as it delves into a history that is sometimes lost in the retelling. At almost 800 years old, Castle Cornet has looked over St Peter Port for longer than pretty much anything else still standing on Guernsey. This fortification houses five separate museums, including the Story of Castle Cornet Museum, the Maritime Museum, the 201 Squadron (RAF) Museum, the Royal Guernsey Light Infantry Museum, and the Royal Guernsey Militia Museum. Each one is worth a visit, and the castle itself will give you excellent views over the town. There is a guided tour on most days, and the knowledgeable guides will be happy to answer questions and give you as much information as you can take. At noon each day the guns are fired – a tradition dating back centuries. Being an island, Guernsey has its fair share of great beaches. Depending on what you are looking for on your particular visit, there will be a beach for you. Fermain Bay near St Peter Port is a steep, pebbly beach with many sheltered, secluded places for relaxing in. 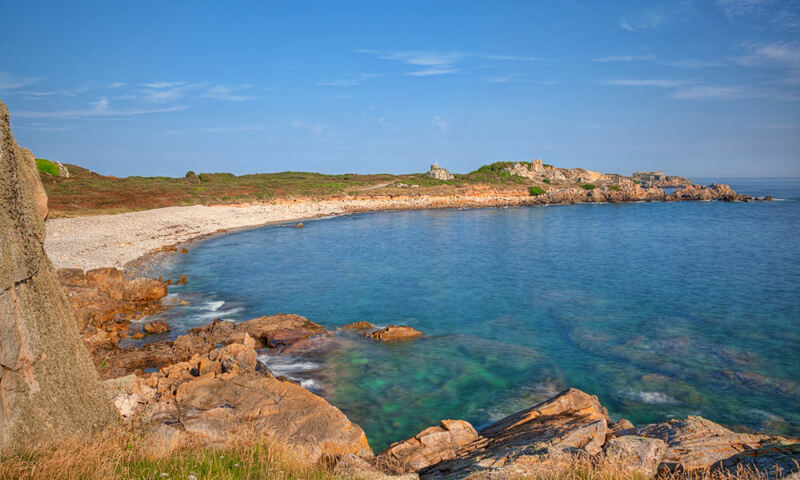 By contract, Cobo Bay is ideal for families with its clean, sandy beach that is just begging for sandcastles, and a tempting sea that needs to be paddled in. Book a mini cruise to Guernsey.